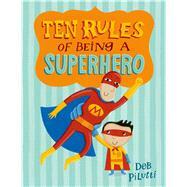 Deb Pilutti is an award-winning illustrator and designer. She was previously a partner at oliebollen.com, where she designed toys and products for the children’s market. This is her third picture book. She lives with her family in Ann Arbor, Michigan, where she spends time daydreaming about which superpowers she’d most like to have if she were a superhero.